Converting Castings to Hogouts Modern Machine Shop 91 applied toward maximizing the metal removal rate in hog- ging aluminum and titanium. Machinists in this area, as in other parts of the shop, are encouraged to initiate process improvements by working with programmers to investigate dif- ferent choices in tool path and cutting tool. The distinction of this area is that the power of the machines makes possible some extreme advances, par- ticularly in aluminum. In the case of one aluminum part that is informally called the "three ball" (its shape suggests this), the first-operation cycle that mills away almost 90 percent of this part's initial stock has been reduced from more than eight hours down to two hours and 43 minutes through vari- ous improvements in feed rate and depth of cut the employees here have managed to achieve. These improvements were driven by wanting to do better, and even (good naturedly) by wanting to do better than one another. "If one guy is tearing it up, I want others to see this. I want them to want to tear it up, too," Mr. Bloom says. 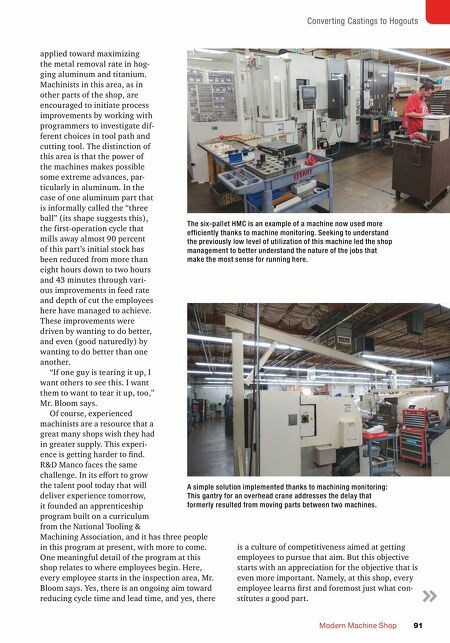 Of course, experienced machinists are a resource that a great many shops wish they had in greater supply. This experi- ence is getting harder to find. R&D Manco faces the same challenge. In its effort to grow the talent pool today that will deliver experience tomorrow, it founded an apprenticeship program built on a curriculum from the National Tooling & Machining Association, and it has three people in this program at present, with more to come. One meaningful detail of the program at this shop relates to where employees begin. 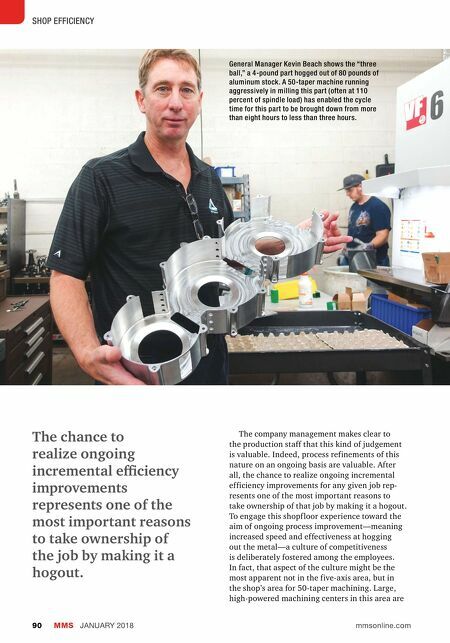 Here, every employee starts in the inspection area, Mr. Bloom says. Yes, there is an ongoing aim toward reducing cycle time and lead time, and yes, there The six-pallet HMC is an example of a machine now used more efficiently thanks to machine monitoring. Seeking to understand the previously low level of utilization of this machine led the shop management to better understand the nature of the jobs that make the most sense for running here. A simple solution implemented thanks to machining monitoring: This gantry for an overhead crane addresses the delay that formerly resulted from moving parts between two machines. is a culture of competitiveness aimed at getting employees to pursue that aim. But this objective starts with an appreciation for the objective that is even more important. Namely, at this shop, every employee learns first and foremost just what con- stitutes a good part.